Posted By:Unknown | At:5:03 PM Be the first to comment! WASHINGTON — Michelle Obama's evening of poetry at the White House set off Republican critics before the artists had uttered a word. The first lady invited prominent writers, musicians and a rapper to perform Tuesday night to "showcase the impact of poetry on American culture," her office said in announcing the occasion. The list of invited performers includes former poets laureate Billy Collins and Rita Dove, Elizabeth Alexander, who wrote and delivered the poem at President Barack Obama's inauguration, and musicians such as singers Aimee Mann and Jill Scott. But it was the inclusion of Grammy-winning rapper and actor Common that set off Republican complaints. Common, who is considered fairly tame as rappers go, is known for rhymes that tend to be socially and politically conscious. Karl Rove, who worked in the White House for President George W. Bush, labeled Common a "thug" and said on Fox News Channel that the performer had advocated assassinating Bush and violence against police. Rove added that the White House decision to include Common in the event "speaks volumes about President Obama and the White House staff." Sarah Palin, for her part, tweeted, "Oh lovely, White House ..." and provided the link to an article critical of the decision. Common, born Lonnie Rashin Lynn Jr., took the criticism in stride, tweeting back, "So apparently Sarah Palin and Fox News doesn't like me." Rove's reference to Common's rap about Bush was based on lyrics criticizing the Iraq war that included the line: "Burn a Bush cos for peace he no push no button." White House spokesman Jay Carney defended the decision to invite him and said reports about Common were deliberately being distorted. Carney said the president has spoken out forcefully against violent and misogynistic music lyrics and has a strong record of support for law enforcement. "I would say that, while the president doesn't support the kind of lyrics that have been raised here, we do think that some of these reports distort what Mr. Lynn stands for, more broadly, in order to stoke controversy," Carney said. He said Fox News Channel just six months ago had described Common as a rap legend. "One of the things the president appreciates, is the work Mr. Lynn has done with children, especially in Chicago, trying to get them to focus on poetry as opposed to some of the negative influences of life on the street," Carney said. The first lady's office had no immediate comment. 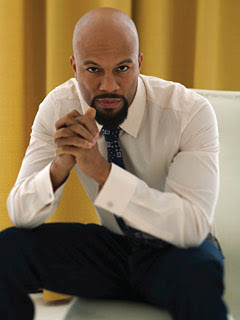 Common, a Chicago-born rapper whose work has praised Obama, also has appeared in films including "Date Night" and "Terminator Salvation." Poet Bob Holman, founder of the Bowery Poetry Club in New York, applauded the White House for inviting a "wonderful array" of poets, and described Common as a "moderate" voice among rappers. "Common's commentary is wildly metaphoric and an imaginative re-visioning of U.S. politics," he said. "Let's listen to what Common has to say and then let's have our reaction." The White House poetry night is part of a series of arts education events that Mrs. Obama has arranged over the past two years to promote different genres of music, dance and now literature. Most of the events have included afternoon workshops for young people and evening concerts. First lady Laura Bush had her own difficulties with poetry at the White House. She canceled a 2003 planned symposium on "Poetry and the American Voice," which would have featured the works of Emily Dickinson, Langston Hughes and Walt Whitman, because some poets said they wanted to use the forum to protest military action in Iraq.